If you’ve every suffered from joint or muscle pain, you’ve probably used a heating pad to soothe the pain. Heat helps to improve circulation to the afflicted area, which in turn helps to ease the pain associated with muscle strains and joint problems. People aren’t the only ones that can benefit from heating pads; humans’ best friends can, too! Veterinarians recommend using heat to reduce stiff and sore muscles in canines. If your furry pal is suffering from arthritis or joint problems like hip or elbow dysplasia, or if he has simply pulled a muscle because he was working or playing too hard, a heating pad is an excellent way to sooth the discomfort your canine companion is experiencing. Many dog owners find that a heating pad offers great relief without medications; but if your pooch is in severe discomfort, applying heat to the affected site is a great way to supplement any medications that he might be taking. Even if your pooch isn’t suffering from muscle or joint aches and pains, a heating pad can still be beneficial for him. For example, if he spends a lot of time outside during chilly weather or if he tends to get cold even when he’s inside, a heat pad for dogs can keep him cozy and warm. Heating pads can also be used for other health issues in canines, such as heart conditions and thyroid disease. If your vet has recommended using a heating pad for your furry friend, or you want to provide your four-legged pal with some soothing heat to keep him warm on cold days, you might be thinking about using the pad that you use for yourself, or running to the drug store and using any pad that you can find. Don’t. Using a heating pad for humans is not recommended for dogs; instead, using a dog heating pad (also known as a dog warming pad). Why should you avoid using a standard heating pad with your dog? What type of features should you look for when looking for heating pads for dogs? In this review, we’ll answer these questions. But first, we offer our top five choices for the best heating pads for dogs. Why Would a Dog Need a Heating Pad? Now that you’ve had a sneak peek at our top picks for the best dog heating pads, let’s take a closer look at each one. Below, we offer a more in-depth look at each of these five heated pads for dogs. In each review, we highlight the features of each option, share what we like about them, and share what pet owners who have used them have had to say. After you read through the reviews and decide which option will best meet the needs of your pooch, click on the buttons to find the best prices currently available on Chewy and Amazon. If your furry friend spends a lot of time outside – whether it’s in his dog house or in a dog playpen, the Lectro-Soft Outdoor Heated Pad from K&H Pet Products is a fantastic option to consider. It features orthopedic foam so it conforms to the contours of your dog’s body for added comfort, making it an ideal choice for pups that suffer from joint issues, such as Dachshunds and Shih Tzus. The cover is made of a PVC material, which is highly durable and resistant to moisture, so it can be used outside without having to worry about it being damaged by dew, rain, or snow. The cover is also quite soft, further increasing the comfort for your pooch. The power cord is 5 ½ feet long for versatility, and it’s wrapped in steel to ensure the safety of your pet. A state-of-the-art thermostatically controlled heater will never exceed the temperature of your dog’s body; it will warm your dog up to his normal body temperature, which means that you don’t have to worry about him overheating, so you’ll have peace of mind knowing that he’s safe and secure. It also comes with a complimentary fleece cover, which is extremely soft, removable, and washable for easy care. Put the cover on to maximize the heat and comfort your pet receives. Cleaning the entire pad is super easy; just wipe id down with a damp cloth and you’re good to go! The pad measures 25 inches by 36 inches, so it offers plenty of space for dogs of all sizes, including Beagles, Collies, and German Shepherds. Others said that they couldn’t feel any heat coming from it. Final Verdict: Whether you’re looking to ease your pet’s sore muscles and stiff joints, or you want to keep him cozy and warm when the temperature drops, the K&H Pet Products Lectro-Soft Outdoor Heated Bed is a great option to consider. If you are looking to keep your pooch roasty, toasty warm while he’s in his outdoor dog kennel, then you should consider the Lectro-Kennel Outdoor Heated Pad, also from K&H Pet Products. This dog heating pad is very similar to the first product on our list, but it is slightly smaller in size. As opposed to being 25 inches by 36 inches, this pad is 22.5 inches by 28.5 inches, so it will fit better on the floor of a kennel. Another way that this pad differs is that it uses 80 watts of power, which is slightly higher than the first dog warming pad. 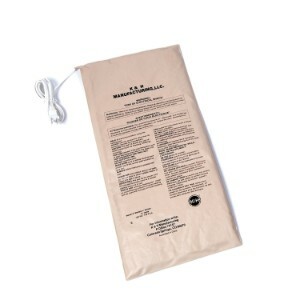 Like the first heating pad from K&K Products, this one also features a 5.5 long cord steel-wrapped power cord for enhanced safety. It has a thermostatically controlled heater, which means that it will never exceed your dog’s body temperature, so you don’t have to worry about him overheating. The thermostatically controlled heater is also energy efficient, so it will save you money on your energy bills. It’s covered in ABS plastic for durability and comes with a complimentary super soft fleece cover, which is removable and washable for easy care. 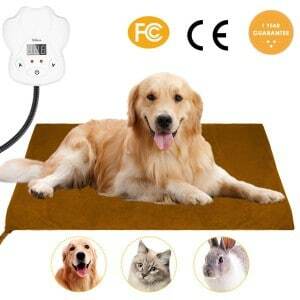 This heating pad is designed for indoor and outdoor use. If you are going to use it in his kennel, you can place it on the floor so that he can lie right on top of it, or secure it to the wall and it will act as a heater for the structure. Final Verdict: If you’re looking to add warmth to your pet’s kennel, you want to provide him with a warm space to sleep inside, or you’re looking for a way to ease his joint pain, the K&H Pet Products Lectro-Kennel Outdoor Heated Pad is worth considering. It’s easy to use, highly durable, and designed with safety in mind. Whether you’re looking to add some warmth to your pet’s dog crate, you want to offer him a cozy spot to curl up in at the food of your bed, or you are looking for a way to ease is stiff muscles, the PETBROO Heating Pads is a dog heating pad that we think (and the majority of pet owners think, too) is a great investment. 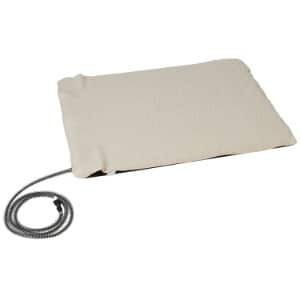 Featuring highly durable and fireproof PVC material, you can rest assured that your pet won’t damage this heating pad, and that the heating pad won’t harm your pet, either. The heating pad is wrapped with a super plush removable cover for added comfort. When it needs to be cleaned, just zip off the cover and toss it into the washing machine. This warming pad can be adjusted to 7 different temperature settings, and it features a thermal protector that will prevent it from exceeding dangerously high temperatures. An LED indicator light accurately displays the temperature of the heating pad, and it only heats up when your dog is lying on it, so if he moves off of the pad, you don’t have to constantly worry about shutting it off. You can use this dog heating pad right on the floor, place it on the bottom of a crate, or use it as a liner for indestructible dog beds. The 5.5 foot steel-wrapped wire and chew-resistant cord casing improves the safety of this bed, and since it’s water resistant, you can easily use it outside. Final Verdict: The PETBROO Heating Pads dog heating pad is durably made and features a soft cover for added comfort. The temperature is easy to control and the steel-wrapped cord and chew-proof housing offers peace of mind. It can be used indoors or outdoors, which makes it very versatile. Next up on our list of the best heating pads for dogs is an option that comes from RIOGOO. This heating bad is ideal for dogs that are suffering from arthritis, illnesses or who are recovery from injuries. It can also be used to keep newborn puppies safe and warm, or to keep pets of all ages cozy and warm. 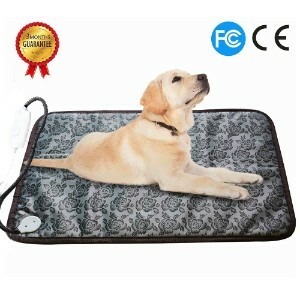 This heating pad for dogs is constructed of oxford fabric for durable and waterproof material for versatility. You can use it indoors to create a cozy spot for your pet to lie, or you can use it inside a crate, kennel, or dog house to warm up the space. The power off protection temperature control provides security, and it’s made to avoid overheating your pet, for even more peace of mind. The cover features a pretty design, too! And, to ensure safety, all heating pads undergo rigorous testing before they are distributed. Final Verdict: The RIOGOO Pet Heating Pad is another great option for warming your dog or soothing his sore muscles and joints. Featuring water-resistant material, an easy to clean design, and a temperature control to prevent overheating, your pet will be cozy, warm, and safe on this heating pad. Last, but certainly not least on our list of the best dog heating pads is yet another product that comes from K&H Pet Products. Their Pet Bed Warmer is specifically made to offer soothing warmth and comfort for indoor pet beds. In fact, it can be used in pretty much any dog bed, no matter what size or shape. This heating pad for dogs features dual internal thermostats, which regulate the temperature of your pet using 4-22 watts, depending on what size warming pad you purchase; there are four different sizes to choose from: small is ideal for small breed pups, like Chihuahuas, medium is perfect for mid-sized breeds, such as a West Highland White Terrier, Large is perfect for dogs that are around the size of a Golden Retriever, and x-large is ideal for giant breeds, like Great Danes. This heating pad will warm the surface of your pet’s bed to about the same temperature that the bed would heat to when he lies on it, so there’s no need to worry about overheating. When your dog gets off the heating pad, it will cool down to about 10 to 15 degrees higher than the ambient air temperature. For safety, never let your pet lie directly on top of the pad; always place it inside the pet bed or cover it with blanket. Final Verdict: With the K&H Pet Products Pet Bed Warmer, you can keep your pooch’s bed toasty warm all year long. It’s easy to use, and is available in four different sizes. When it comes to caring for your dog, you want to make sure that you are providing him with the very best of everything; after all, he’s more than just a pet: he’s a member of your family. To ensure that you are giving your pet the best care possible, you’ve probably put a ton of research into the products you offer him. You feed him the most delicious and nutritious dog food from the perfectly sized dog bowl. You’ve made sure that his dog collar fits him just right and that you are using the best dog harness for those daily walks. You offer him a slew of options to keep him entertained, like automatic fetch machines, interactive dog toys, and puzzle toys for dogs. You even use dog activity monitors and a GPS tracker for dogs to keep tabs on him. Yes, it’s safe to say that you are doing all that you can to keep your four-legged family member happy and healthy. But there’s another product that you might want to consider adding to your inventory of pup supplies: a heating pad for dogs. Why would you need a heating pad for your dog? What should you consider when you are purchasing a heating pad for your pooch? In this section of our review, we’ll answer these questions and more so you can ensure you are providing your furry pal with the very best of care. There are a lot of reasons why you might want to use a heating pad for your dog. In the beginning of this review, we discussed how heating pads for dogs are a great way to alleviate joint pain and muscle aches in canines. So, if your pup is suffering from joint issues, like arthritis or hip dysplasia, or if he has pulled a muscle while playing or working, a heating pad can help to soothe his pain. Heating pads aren’t only for easing pain. Some dogs tend to run a lower body temperature or feel chilly, whether it’s because of their size, their breed, their age, or because they are suffering from a health condition. For instance, newborn puppies need extra heat, and canines that are suffering from a heart condition or thyroid disease might need extra heat to keep them warm. A heating pad is also a great way to keep your pet warm when the temperature is cold. Whether he spends time outside in a dog house or you just want to offer him a cozy spot to curl up in inside, a warming pad is a great tool to have on-hand. The size of your pet is definitely something that you are going to want to consider. Obviously, you don’t want to get him a pad that is too small; but a pad that is too large might not be effective, either. Choose a heating pad that offers your pet enough space to get comfortable, but isn’t overly large. Where will you be using the heating pad? Outdoors, indoors, or both? Make sure you choose an option that will work in the location that you intend on using it. You’ll also want to make sure that you select a heating pad that is easy to care for; for example, a removable and washable cover allows for easy cleaning. Safety features. Safety is paramount. 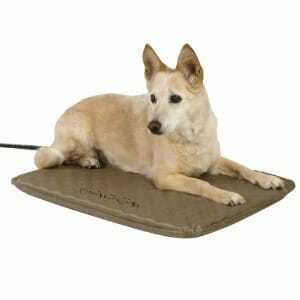 Consider a pad that features a steel-wrapped cord, chew-resistant features, and temperature regulation that will prevent your pet from overheating. Heating pads for dogs can be used for a variety of reasons. Whether you are using it to ease your dog’s joint or muscle pain, or you want to keep him warm, with the best heating pads for dogs, you can ensure the comfort and happiness of your four-legged best friend.